Susan Tyrrell (born Susan Jillian Creamer; March 18, 1945 – June 16, 2012) was an American actress, painter, and writer. She is known for her Best Supporting Actress Oscar-nominated performance as Oma in Fat City, and for her role as Ramona Rickettes in the John Waters movie Cry-Baby. In 2000, she was diagnosed with thrombocythemia which led to amputation of both her legs below the knee. She spent the years painting and writing. ↑ Odam, Matthew. "Actress Susan Tyrell Dies at 67". Austin Movie Blog. Retrieved 2012-06-18. ↑ Daniel E. Slotnik (June 21, 2012). 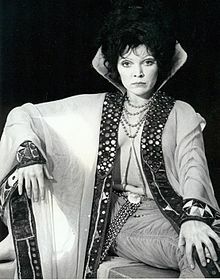 "Susan Tyrrell, Oscar Nominee, Dies at 67". The New York Times. ↑ Corinne Heller (June 19, 2012). "Susan Tyrrell of 'Cry-Baby,' 'Fat City,' dies at age 67". OnTheRedCarpet.com.